Hideaki turned 41 last week, kicking off a month and a half of celebrations: his birthday, our anniversary, the baby's due date, and my birthday. From now on late summer and early autumn will be a busy time, but I do NOT want to be one of those families that celebrates everything all together. That's just lame. It's hard to justify spending money on a present when there's so much to buy for the baby, so I decided my gift would be to make him a cheesecake. This was actually supposed to be a great big sacrifice, because I hate cheesecake and would be putting all the effort into something that only he could enjoy. I was in for a few surprises though, the first being that cheesecake isn't that hard to make. Or maybe it's hard to make well- you can see that it's a little messy and I've gone outside the edges a bit with the filling. But for a first attempt by a cheesecake hater, it's not bad. This is an unbaked cheesecake (who wants to bake when it's 35 degrees?) made with mascarpone, cream cheese and cream, based on this recipe (substituting lemon zest for orange zest and omitting the orange slices). Yup, it's a kid's recipe, but perfect for a beginner like me. 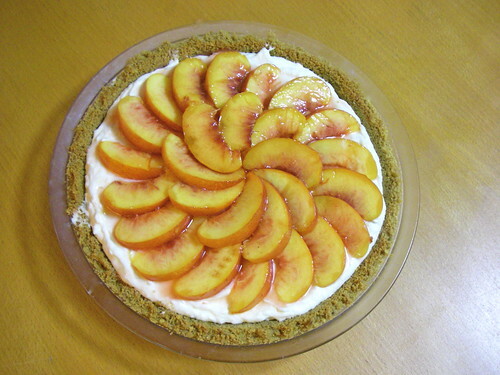 I topped it with with nectarine slices macerated in a bit of sugar and lemon juice for a few minutes, and if you can ignore the mess on the crust it almost looks pretty. And it tasted amazing. That was the other surprise- I don't hate cheesecake! In fact, I quite like it. 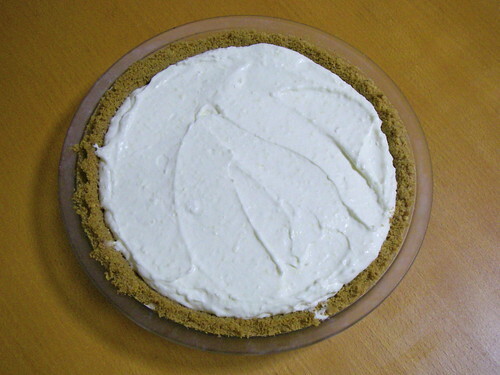 I probably still don't like the baked kind, or the unbaked kind if it was made with gelatin and lots of sugar, but this was delicious and I think I'll have to buy a cheesecake ring so I can make this again properly. All Hideaki wanted for his birthday dinner was curry rice, and I was happy to oblige as I don't think I've made curry all year (I went off curry in my first trimester and even after my food aversions ended I didn't feel like cooking it). I made what we call keema curry, which is based on Japanese style keema curry, which is very loosely based on actual keema curry. Our version uses ground pork, garam masala, and lots of onions and tomatoes and I love it because it cooks fast and doesn't need any of that nasty store bought Japanese curry roux. I'm sure it is nothing at all like real keema, but the name has stuck and that's that. 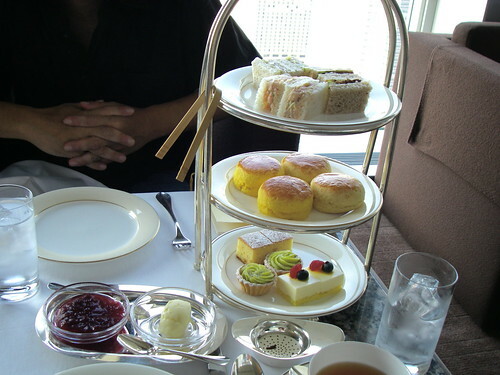 On the weekend I took the birthday boy out for high tea at the Peak Lounge in the Park Hyatt. 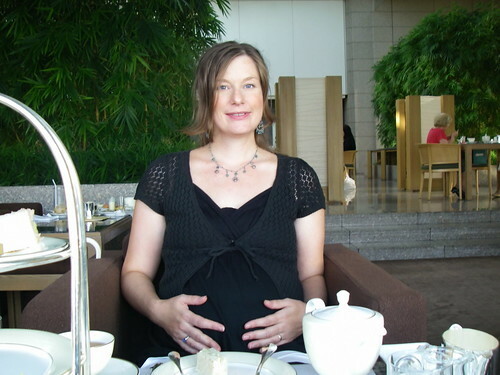 I love their high tea and we figured this was our last chance to enjoy it for a very long time. He started off with an iced cappuccino, which I'm sure is hardly traditional but hit the spot on a very hot day (I had one later and it was the best iced cappuccino I've had). The waitstaff were very nice, cautioning me not to fall down those stairs seen above when we entered (Japanese people are very concerned about pregnant ladies on stairs), bringing me a pillow for my back, and not seeming at all disturbed that I had way more caffeine than a pregnant woman should. The weather was not quite clear enough for excellent views, but a blue sky and the buildings of west Shinjuku weren't bad to look at. I started with a pot of Assam, and although I know nothing about tea I can tell this was good because that sugar cube in the picture went unused (I normally can't drink hot tea without loads of sugar). 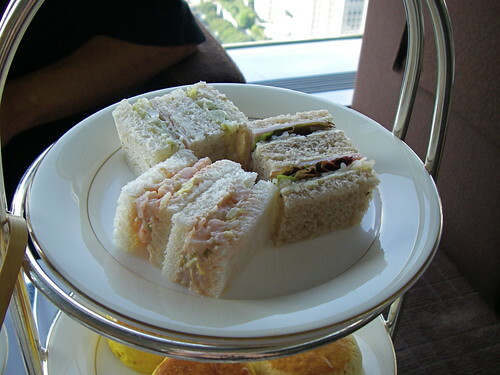 The food began with the classic three-tiered serving of sandwiches, scones and cakes. The sandwiches were shrimp and tomato, ham and cabbage and I forget the last; all were tasty. 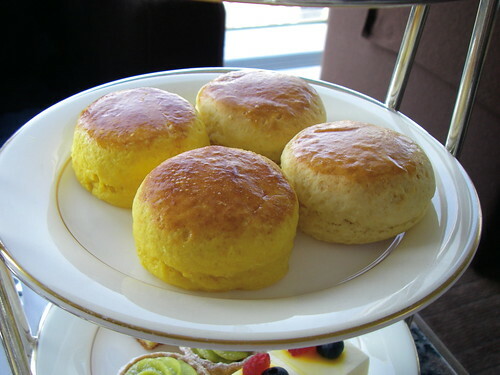 The scones were mango and plain, both delicious and the proper British style that I love (I can no longer eat the giant, dry North American coffee shop kind). The mango ones were nice but I'd just as soon have both plain. 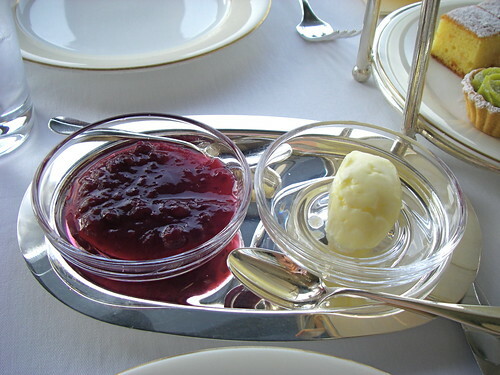 Served with the traditional red currant jam and clotted cream. The cakes were very well made but were more of a treat for Hide. I may like cheesecake but I'm still not a big cake person. After the above treats were gone we were periodically brought trays of sweet and savoury snacks to choose from, and we were soon stuffed. I forgot to take pictures of these supplementary treats, but I did make another discovery: I like panna cotta. I don't know if it's a pregnancy thing or not, but it seems I'm losing my hate for gooey, rich creamy things. I'm also not sure if this is a good thing or a bad thing. So that's one celebration down, three more to go. 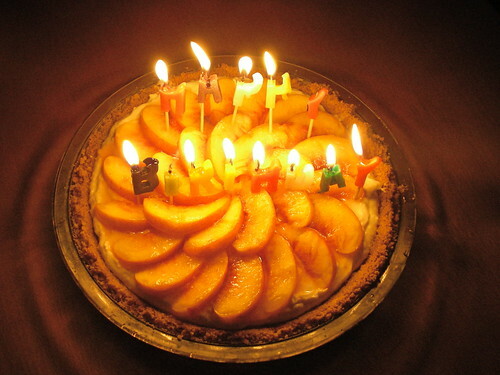 Just think, the next birthday we celebrate will be an actual birth! that cheesecake is actually pretty. Gorgeous looking treat you made there! 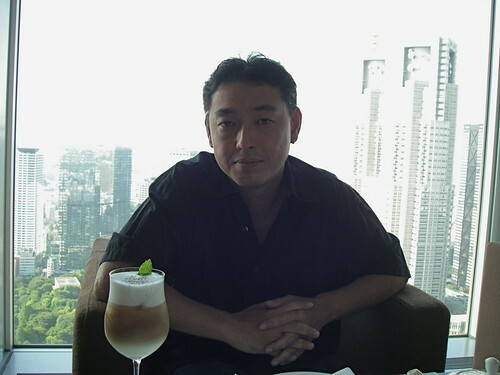 And what a luxurious place to enjoy the Tokyo view and be pampered. Great blog! One that's very informative and easy to navigate - love it! and i love your cake too.. nice job! 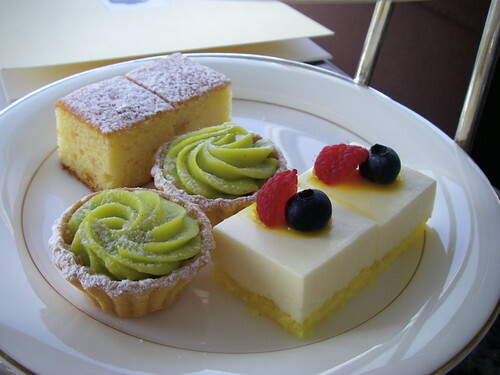 Such a lovely high tea - and congratulations on your cheese cake. Well, I've got your blog in my reader and pop in occasionally--usually when a stack has built up. Love reading your blog n enjoying your pictures. we don't have much here in montreal, so every time we go to toronto we'd go to tim horton to buy some even though they are like you said giant and dry [sigh...]. for the losing of hating gooey &creamy thing, i think it's all because of the baby--that's what he wants[it still seems to me you are having a boy ]. i started to eat spicy food when i was pregnant with my 1st one,to eat sweets with the 3rd one. and now only 1 of my 3 kids [2nd one] likes salty food like i do. by the way, my husband likes bitter stuff [goya]. it's very 面倒臭いto figure out what to cook every night! hope you don't have to cook for 3 different tastes later on. love your blog ! i check every day to see if there's an update. and all the best to you all. Joyeux Anniversaire Hideaki!Joyeux Anniversaire Amy!Je le dis encore une fois : tu es resplendissante! High tea looks like tons of fun. Would you add a recipe for your keema curry? How much did you pay? Drinks at night are well over 1,000 yen each. Not long to go now.My No 2 was due on the same day 2 years ago.Didn't quite make it but she lives by her own rules;).Enjoy the last few weeks and all the scones you can! Elsie, I'd be really tempted to assume my new taste for cheesecake is completely pregnancy related, but my palate has been slowly growing up a bit and in recent years I have added olives and avocados to my list of favourite foods. I can also tolerate, and sometimes even enjoy, mayonnaise, which was once my most hated food. I guess I'll find out soon whether the cheesecake thing is permanent or not! Very nice pictures, Al. We had dinner at the New York Grill ages and ages ago, and have been to the Peak Bar a few times too. Stunning night views and excellent food and drinks. Peak Bar actually has a pretty good happy hour sort of special, and if I weren't pregnant we'd have gone for that (I think it's under 5000 yen for nomihodai and a very nice selection of appetizers). The tea was about 3200 yen, which I think is extremely reasonable. Marianne, if my husband is so easily pleased that all he wants is curry, I'm not going to complain! 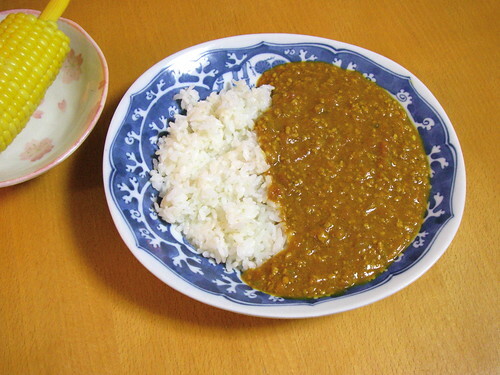 And I didn't even know what "Furu-che" was, but after looking it up I'm glad I don't have to make it! I was amazed with the cake. Very simple yet lovely. I want to make something like that. Hullo Amy, Firstly, congratulations on the arrival of Shuma James. 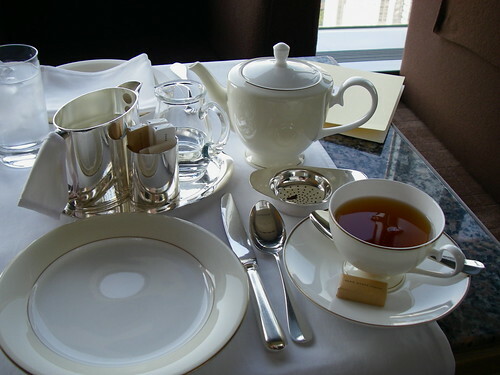 I am new to your blog, and would like to ask if the 3200 yen quoted for afternoon tea was for one or two? 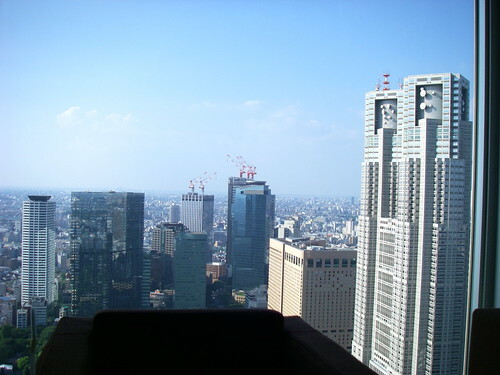 I would guess one, it being i) Tokyo and ii) Park Hyatt. Thanks.